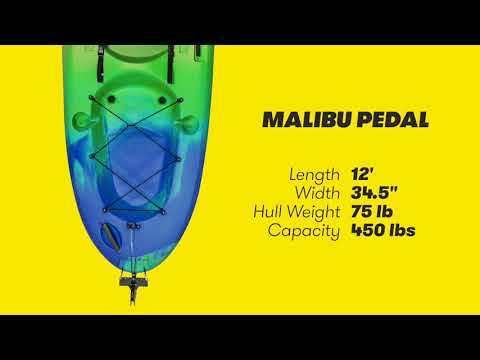 Dive in feet first with the Ocean Kayak Malibu Pedal Kayak. 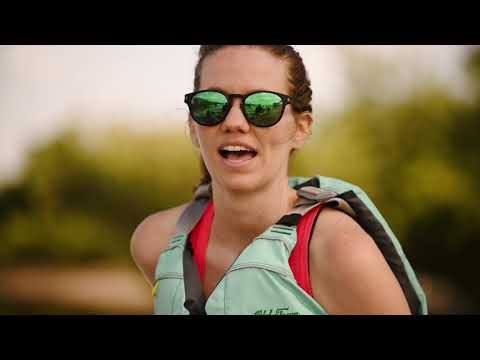 The Malibu Pedal features an the advanced PDL Drive System that makes for a fresh new kayaking experience. The malibu Pedal is fun, zippy, stable and has turn-on-a-dime performance. A kid's jump seat in the stern makes family outings a breeze, and the Malibu Pedal even has plenty of room to bring your dog along for a complete family adventure. The PDL Drive System is capable of reaching 5.5 MPH with an impressive 10.3:1 gear ratio for efficient pedaling. It mounts into the Malibu Pedal in seconds and in shallow water it can tip up to its docking position in an instant. The pedals are padded for barefoot comfort and grip. The PDL Drive System console also doubles as splash resistant storage with a 6 inch access hatch. Full warranty included. Q: how long is that track? wanting to mount a fish finder. Q: Does the front and rear storage fit a Yeti Roadie? A: Thanks for your question! Neither the front nor rear storage would fit a Yeti Roadie. Q: Are there any rod holders that will work with this kayak? A: This kayak comes standard with two gear tracks that you can attach most accessories to. You just need to be sure you get the correct track adapter piece that matches the rod holder or whatever other accessory you use to attach it to the kayak. Q: Does the price include a paddle? Also, is there a holder for a paddle on the kayak? A: This kayak does not include a paddle or paddle holder, but we do offer 15% off most accessories with the purchase of a kayak.